The man was covered in grease and oil and was trapped in such a condition that he could not move, according to police. The 29-year-old man was found trapped in a grease vent. 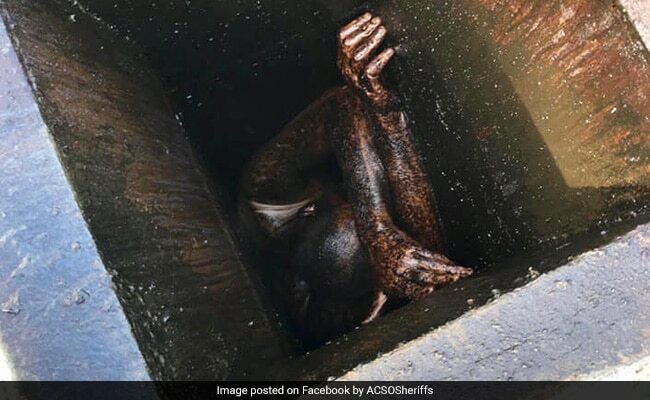 A possible burglar had to be rescued from the grease vent of a vacant Chinese restaurant in California, USA, after being trapped there for two days. Alameda County Sheriff's Office said in a Facebook post that emergency crews responded to reports of a "a faint voice calling for help" from the building in the San Francisco area. "When first responders arrived on scene, they could hear the voice and quickly determined it was coming from a roof vent atop the restaurant. A ladder was extended and personnel were able to locate a 29 year old man trapped in a sheet metal grease duct running from the roof to the kitchen," Alameda County Sheriff's Office said in its post. They also shared three pictures, one of which shows the man inside the vent and completely covered in grease. The man was covered in grease and oil and was trapped in such a condition that he could not move, according to police. Firefighters worked for almost an hour to extract him from the metal duct. The Alameda County Fire Department also shared pics from the incident on Instagram. The unnamed man was found to be physically exhausted and dehydrated, but is expected to make a full recovery. After the rescue, he was transported to a local hospital for treatment. Police say that it is unclear whether he entered the restaurant with the intent to commit burglary. They are now conducting a trespassing and vandalism investigation.